"Bluff Dweller" Indians were the first residents of the area. Later, the Osage, a branch of the Sioux, was the main tribe. One of their larger villages is thought to have been to the east of the present site of Harrison. Cherokee Indians arrived around 1816 but did not get along with the Osage. This hostility erupted into a full scale Indian war in the Ozark Mountains. By the 1830s both tribes were removed to Oklahoma. Some historians contend that the first white men to visit the area were followers of Hernando De Sota. It is more probable that the first white men were French hunters or trappers. Harrison was named for Union General M. LaRue Harrison, who surveyed the town site. It is also said that Jesse James and his brother Frank once used the area as a hideout. Harrison's history has been one of constant growth and improvement in civic facilities, industrial expansion, agriculture, education and recreation. Its economic base is built on manufacturing, retail, wholesale sales, agriculture, and tourism. Harrison features fun-filled days and nights with a variety of attractions for the whole family. For daytime activities there are two museums, a trout farm, shopping in beautiful downtown Harrison, having lunch at one of our unique restaurants, visiting area caves, golfing or taking a stroll or picnic at Lake Harrison. Harrison is booming at night with dramatic productions by The Lyric Theater, bowling and fine dining at one of our local restaurants. 10 public schools and 4 private schools give area students numerous education options. 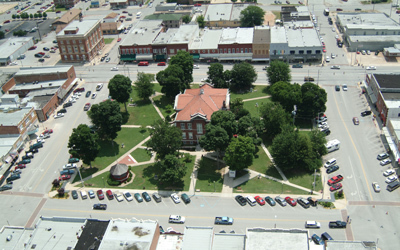 Harrison is also host to North Arkansas College, which supplies higher education. Southwest Missouri State University and Arkansas Tech University are additional options located just 65 miles away. North Arkansas Medical Center provides health care to the area. It has achieved accreditation from the Joint Commission on Accreditation of Healthcare Organizations. Boxley Valley is the very best destination to see the Arkansas elk herd. The elk are a 12 month attraction. Visitors can witness the entire life cycle of elk from calving in the spring, to mating season in the fall. For water recreation the Buffalo National River is one of the few remaining free-flowing rivers in the lower 48 states offering both swift-running and placid stretches. The river also has 3 designated wilderness areas within its boundaries. People from all over the country come to enjoy the fishing that the Ozarks have to offer. Whether you're looking for bass fishing along the Buffalo National River or trout fishing at Bull Shoals Lake, our area accommodates everyone! In addition, north Arkansas is part of a geologic area known as the Ozark Plateau which contains over 4,500 known caves. While most of these are undeveloped, 8 "show caves" offer adventure, beautiful calcite formations, history and fossil remains. Of the 8 show caves, 3 are within a 30-minute drive of Harrison. Come by our office the next time you're in town and allow us to show you some of the many wonderful real estate opportunities we offer. This is a great place to live and do business. Let us make your dreams come true!